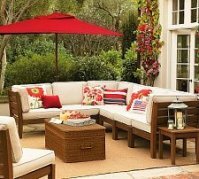 Unless you have natural shade or a covered outdoor area, you will need a patio umbrella to provide relief from the summer sun. You will need at least one table (maybe more) for eating without sweating and squinting. Umbrellas come in a variety of sizes, styles, options and materials. Is one style best for you? There aren't dramatic style differences between umbrellas, but there are a few small things worth mentioning. The most common style is supported with a center pole that extends through a table. Most of these have the ability to close when not in use. A hand crank closer is a nice feature, as is a tilt option. After all, the sun isn't always straight overhead. Some umbrellas are vented to allow heat to escape, rather than being trapped inside the canopy - another nice feature. Center pole styles require a base, to hold the umbrella in place. The heavier the base, the more stable it will be in harsh weather. There are times when a center pole style won't work. If you already have a table without a hole, you still need an umbrella. Voila! - the offset or cantilevered style is for you. 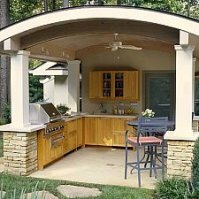 This style has a heavy base that rests on the ground outside of the radius of the canopy. There is a curved pole that extends for support from above. 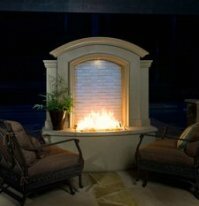 This style is also perfect for shade over a seating area without a table or over a hot tub. The vast majority of patio umbrellas are round, but square or rectangular models are available. Which material is best for your patio umbrella? The quality of the fabric used for a patio umbrella is typically reflected in the manufacturer's warranty. If there is a one year warranty - that means one season. If you get a three year warranty, you can expect the fabric to be much more durable and will last several years with proper care. Sunbrella brand is an excellent choice for umbrella fabric, and has a five year warranty. The center poles can be made of wood, aluminum, or fiberglass. Generally, aluminum or fiberglass will last longer and perform well in harsh conditions. Wood is attractive, but is prone to deteriorate in the elements. As usual, expect to pay a bit more for quality, although over time you'll save money. There are specialty materials, such as thatch, bamboo and some novelty materials. I recommend sticking with the better quality fabrics. What size patio umbrella do you need? 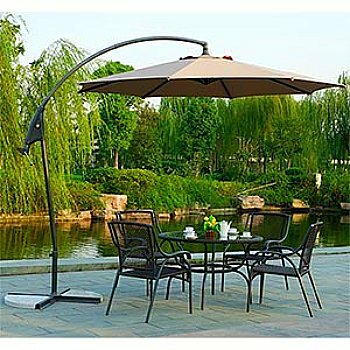 There are a few accessories for patio umbrellas that can add some pizazz and some functionality. Lighting can be added under the canopy - varying styles include LED spot lights, rope style lighting and incandescent globe type lights. Lights either attach to the pole or to the canopy "skeleton". These options provide easy lighting for after dark eating, card games, or other activities. Umbrella covers are an inexpensive but valuable addition. They can make a huge difference in the life expectancy of your fabric. 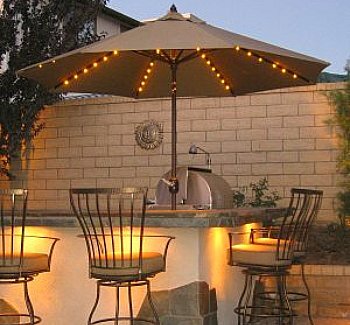 There are even electric radiant heaters that can be added under you umbrella canopy to knock off the chill of a beautiful fall night.